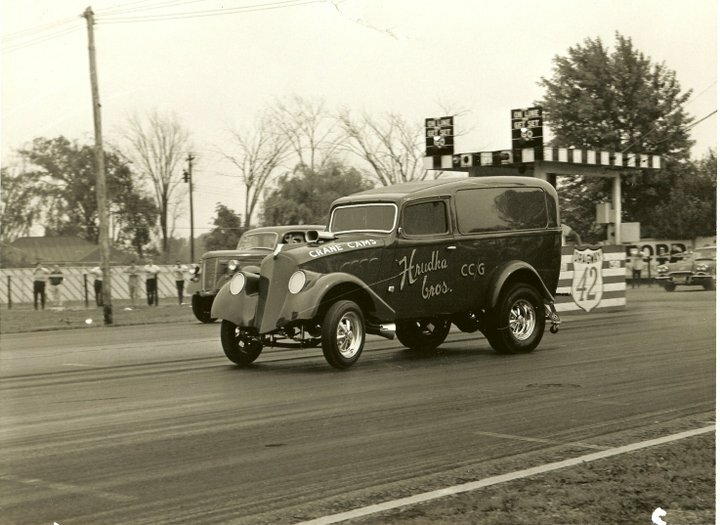 The Quarter Mile Foundation offers several different programs for individuals and businesses to support the efforts to document and share the history of drag racing and the performance aftermarket. The need to tell the story about the sport and the industry it built is long overdue. The younger generation which follows in the legends’ footsteps need to understand the effort and the sometimes brutal sacrifices that were made. If the Foundation does not get the recollections of the pioneering legends – of their careers, plus tell the stories of their peers who have already died, these first-hand stories will never get recorded. And, all of us will be poorer for it! Each support program outlined below is tailored to the budgets of individuals, as well as the businesses — from small to very large. Every contribution is used to further the journey to the completion of the PROJECT 1320 documentary, and the archiving of the materials used to make it. Since the Board of Directors receive no compensation, and there is no paid staff, each dollar has a major impact on reaching that goal. Together, united as one in honor of those that gave of this great sport and industry, we will be able to share and preserve forever the stories of the brilliant pioneers which helped to shape an American culture and traditions. Their stories are the stories of the American dream, creating greatness from nothing but their seemingly impossible dreams. The spirit of innovation, fearlessness, technological exploration, competition, and entrepreneurship is still alive today, and more important than ever. The Friends of PROJECT 1320 program is designed for individuals to become a lifetime supporting member of the Quarter Mile Foundation. Each Friends of PROJECT 1320 member receives a PROJECT 1320 T-shirt, Cap, Hat pin and decals plus discounted pricing on the PROJECT 1320 collector’s edition documentary DVD set and access to the Members Only section of the Quarter Mile Foundation/PROJECT 1320 website. The program costs $43.90 ($36.95, PLUS $6.95 shipping/handling fee) for U.S. residents. Foreign/overseas memberships are welcome, but the costs vary due to destination shipping/handling fees. Outright contributions tothe Quarter Mile Foundation qualify for tax-deductible status, for the year the membership or contribution is made, under the provisions of Section 501(c)(3) of the Internal Revenue Code (residents of the United States of America only). Any additional annual donations may be made to the Quarter Mile Foundation, which will receive a continued tax-deductible status for that year. This is ideal for individuals and for small businesses, and is anonymous, with no benefits attached, as with the “Friends of PROJECT 1320” program. 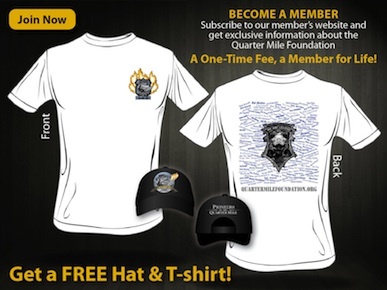 Promote your business and support The Quarter Mile Foundation! 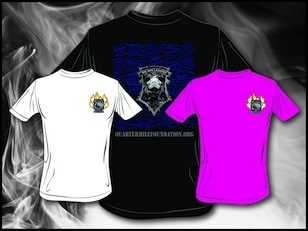 Sign up now… fill out the form below and you will be redirected to a Paypal payment page. That’s all there is to it! What’s not to like?! The Quarter Mile Foundation welcomes and encourages larger donors to participate in the support of its goals. We work with each donor individually to craft a package that meets their desires. For U.S. donors, these contributions are tax deductible for the calendar or fiscal year in which the contribution is made. In most cases, a donation of $5000.00 can secure up to 10 – 15 interviews in one location. If desired, these contributions will be publically acknowledged through announcements to the media, logo and website link placement on the Foundation’s website, along with acknowledgement in the credits on each episode of the documentary, and the boxed DVD set which will be sold following the airing of the documentary.